Al Mancini discovered his passion for food while living in New York City, where he attended law school by day, tended bar and made pizza at the infamous punk club CBGB by night, and explored the Big Apple’s dynamic dining scene during every spare moment in between. For the past nine years, he’s served as the restaurant critic for Las Vegas CityLife. 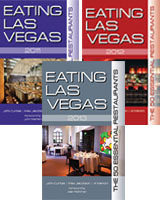 He’s also written extensively about food and dining for numerous local lifestyle publications, such as 944, Where, What’s On, Desert Companion, and Luxury Las Vegas, has served as a contributor to the international guidebook Time Out Las Vegas, and writes his food blog at AlMancini.net. Al is the co-host of a new Travel Channel show debuting in early 2013.